When I was growing up, being a Boy Scout was pretty fun. I enjoyed the camping, the fishing, the marshmallows, learning things that I didn’t learn in my regular classes. Sadly, I never advanced far enough in scouts to be recruited into the wing of the BSA that trained young men to become black ops field agents. That actually may not be such a bad thing. 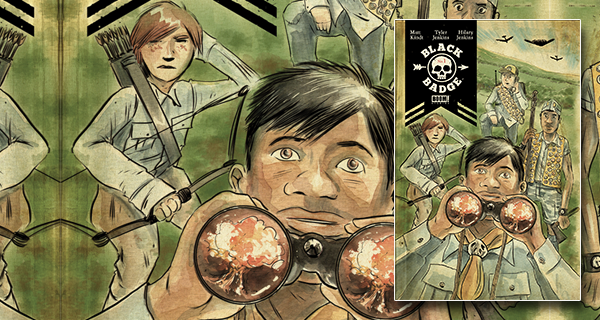 Black Badge #1 is a fairly standard first issue in that it sets up the basic premise of four Boy Scouts going into the woods in North Korea and then everything goes kooky. In all honesty, there’s not that much that happens in this issue beyond setting up the premise and setting up the cast and getting us to ask a few questions, which is fine. Writer Matt Kindt knows how to set up first issues for these types of series, and he works well at establishing all the elements you need to hook you into the series. Kindt has proven that he can pull off stories of many different lengths and knows how to string along mysteries for as long as they need. 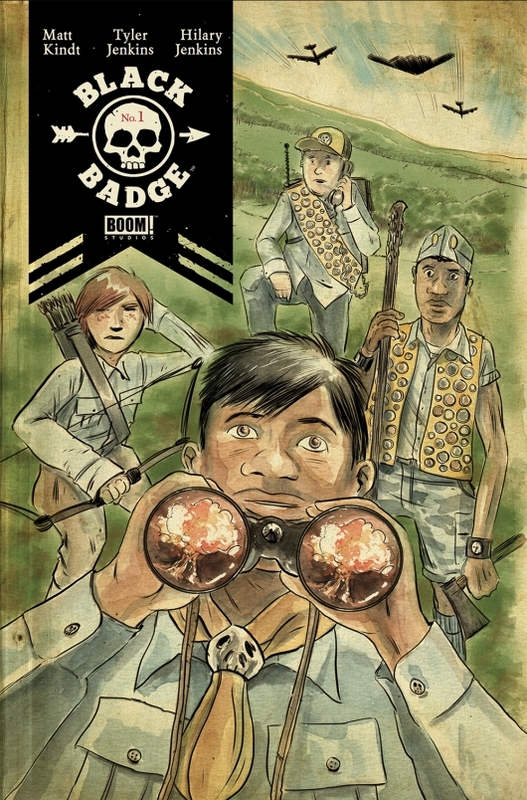 Black Badge #1 introduces a number of plot threads to be followed up on throughout the series and all of them could be a series in and of themselves. I’m already intrigued to find out what brought these characters together, who’s in charge, and what the history of the organization is. This is all familiar to other work that Kindt has done in the past, but it’s a different enough flavor to get me to check out the next issue and beyond. The art by Tyler Jenkins is similar to Jeff Lemire or even Matt Kindt’s style, which I can see as not being everyone’s cup of tea. It’s a very impressionistic style with as few lines as needed and is not as overly detailed as other artists. I can understand if others don’t like the art as much as I do because it’s definitely not what you see in a lot of other books. For me though, Jenkins’ art and the colors by Hilary Jenkins are effective throughout and in one sequence of the book, the art is particularly effective at getting over a sense of claustrophobia. For me, the art and colors work perfectly for the story and Jenkins’ art tells the story very well. I appreciated the call out to Kindt’s Mind MGMT series and now I’m half curious if they will tie together, even though I don’t need them to. There’s room for silly callbacks in stories without everything being connected, in my opinion. All in all, I had a good time with Black Badge #1 and I’m excited to read the next issue. There’s an interesting premise and a lot to be explored going forward and I’ve liked enough of Kindt’s books in the past to have faith in him as a writer.